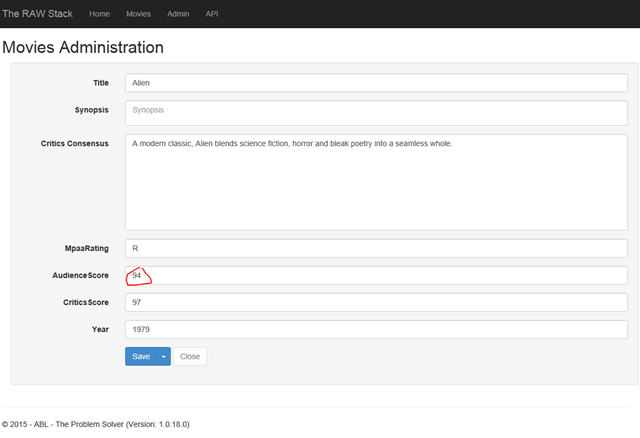 In my previous post I showed primarily how you can select elements based on the ng-* attributes when using CodedUI. In this post I will complete the scenario on how we can test the sample application created by my colleague MVP Maurice de Beijer, who is an Angular expert. 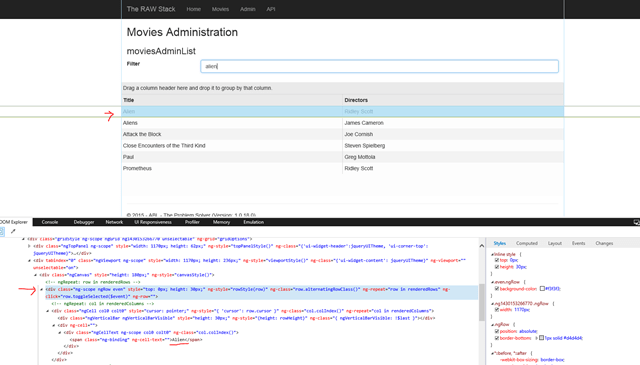 Goto the site http://rawstack.azurewebsites.net/, Click on the Admin link, enter a movie in the filter box, Click on one row and then read out the audience score value and assert on the value. Below you see the steps including the screenshots so you can follow along the steps how to implement this. The next step is that we want to find the filter box, as described int he previous post. The challenge we have here is that this box is not available right away. What happens is that the site goes out with an Ajax request to get a list of data and when the data is returned shows the grid with the data and the text box where we can type the filter text. To show progress the page has an progress indicator that shows an Ajax request is ongoing and this indicator is hidden the moment the Ajax call is done. Now we can search for the filter control and we can ensure we will find it. And that is all to make it work. The solution I showed here works cross browser, so by just setting the BrowserWindow.CurrentBrowser = “crome” or “firefox” you can run this test also on chrome or Firefox with the same results. We have a xml repository for specifying the search attributes. And we have a repository generator exe file that will automatically create a cs file on build. This file is used by our code. currently our framework is not supporting angular JS. 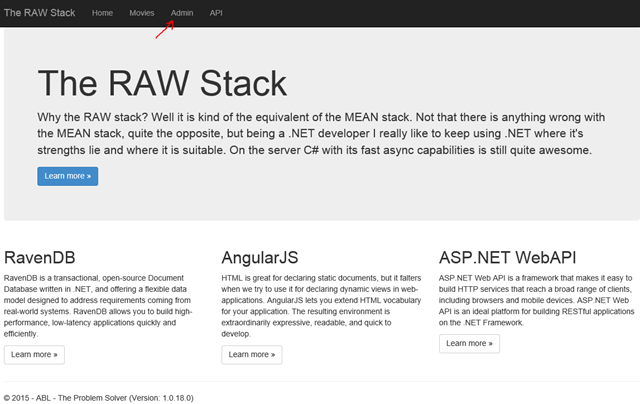 It is not identifying the page itself with angular elements. Do you have any solution? Thank you for all your blog posts on CodedUI. I have also watched all your pluralsight videos on this topic. They have helped me tremendously. I noticed that they are not nearly as many online resources for CodedUI compared to other test automation framework (e.g. Selenium). Do you know any forums or communities that could help me understand CodedUI in depth or help me answer any related questions I might have? No sorry. this is exactly why I try to write as much as I can what I learn all the time. Stack Overflow is of course also a great place to ask questions, there are multiple people who help out there as well.